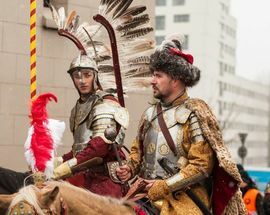 Polish Hussars (cavalry) during Independence Day celebrations. The Fall of Poland by Jan Matejko depicts Tadeusz Rejtan’s emotional protest against partition. ‘The Balance of Power’ - satirical British illustration pretty much summed up Poland’s situation in 1772! Polish soldiers at a machine gun position near Miłosna, in the village of Janki, Battle of Warsaw, August 1920. 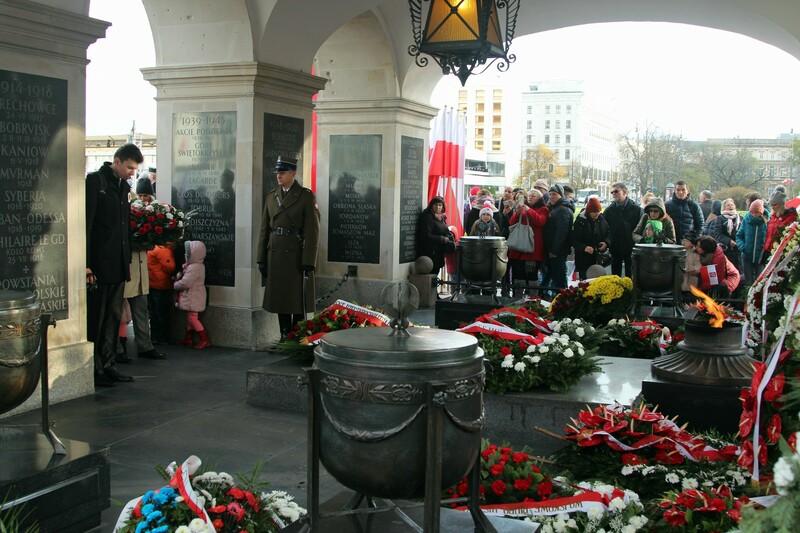 11 NOVEMBER 2018 marks a very important day in Poland's history. 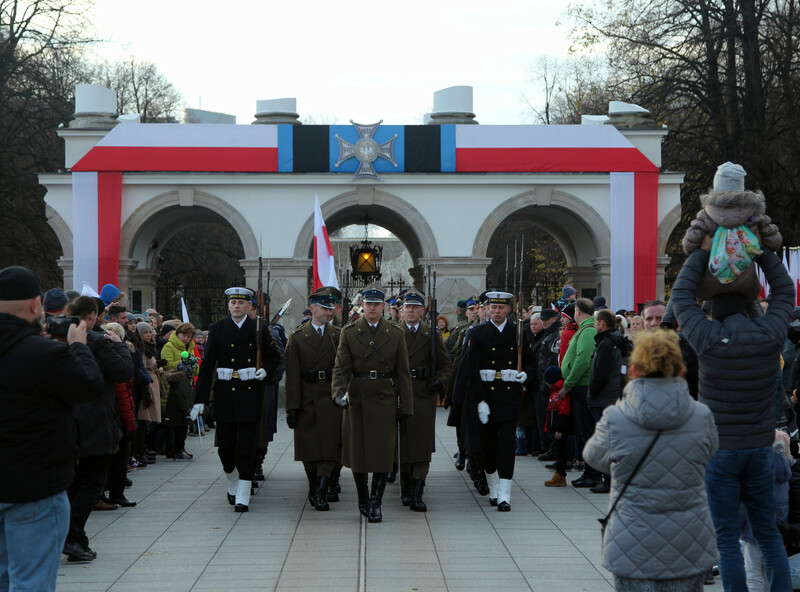 It's a time to commemorate not only the end of World War I, as is the case in western Europe on what is known as Armistice Day, but most importantly to Poles, their county's re-emergence on the map of the world, returning from an imposed status as a stateless nation - National Independence Day (Narodowe Święto Niepodległości). Prepare yourself for a turbulent read, for Poland's history, as you may already know, has certainly been topsy-turvy, bloody and violent! 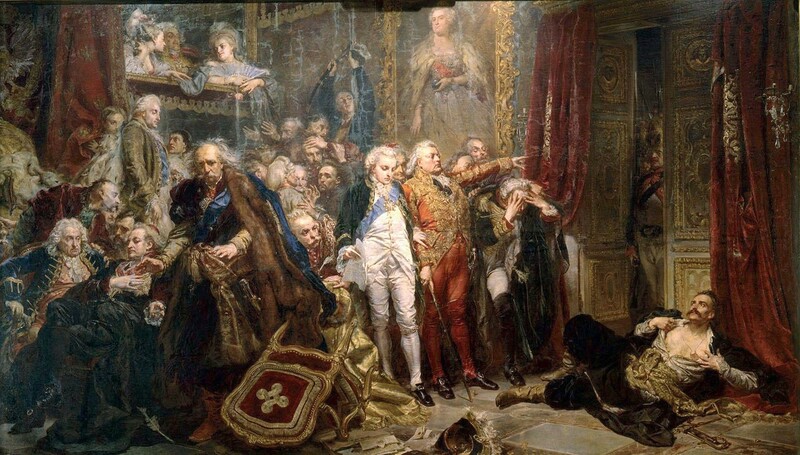 It was way back in 1795, during the third partition of the Kingdom of Poland that the country effectively ceased to exist, split between three regional powers of the day: the Russian Empire, the Kingdom of Prussia and the Austrian Habsburg Monarchy. And so it was to remain until 1918. 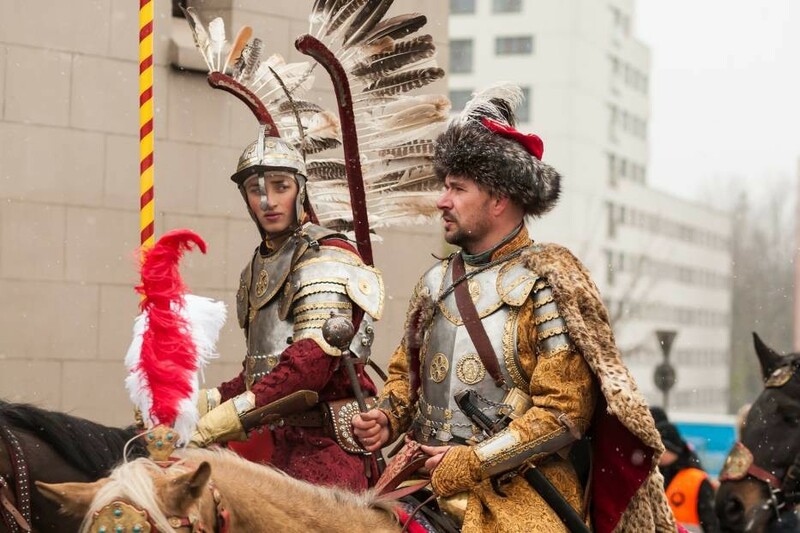 But it was 23 years before that the first steps of the break-up of Poland began - a fraught process, ending the mini-empire of the Polish-Lithuanian Commonwealth (1569-1795), which prior to its dissolution consisted of an estimated 14 million people. 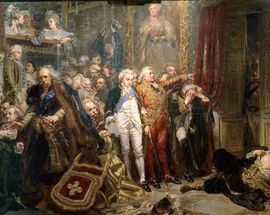 It all officially started in 1772 with the 1st partition of Poland, but there were many factors leading up to this event. 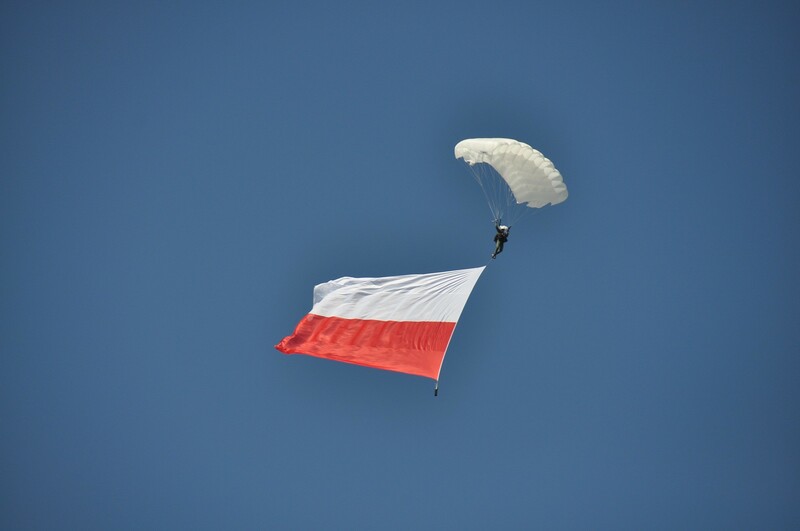 Poland had previously been weakened by external wars, invasions, civil war within the commonwealth, and as has been the case throughout its history, geography itself played a role against Poland as it lay in the middle of Europe, surrounded by expanding empires. Most notable was the Russian Empire, gaining strength following successful campaigns against the Ottomans in the Russo-Turkish War (1768-1774). The Habsburgs to the west were uneasy with the growing Russian threat and initially considered war, however, peaceful means were sought, with negotiations leading to the Polish-Lithuanian Commonwealth being carved up like a cake. Brutal for Poland, but from their points of view, effective. 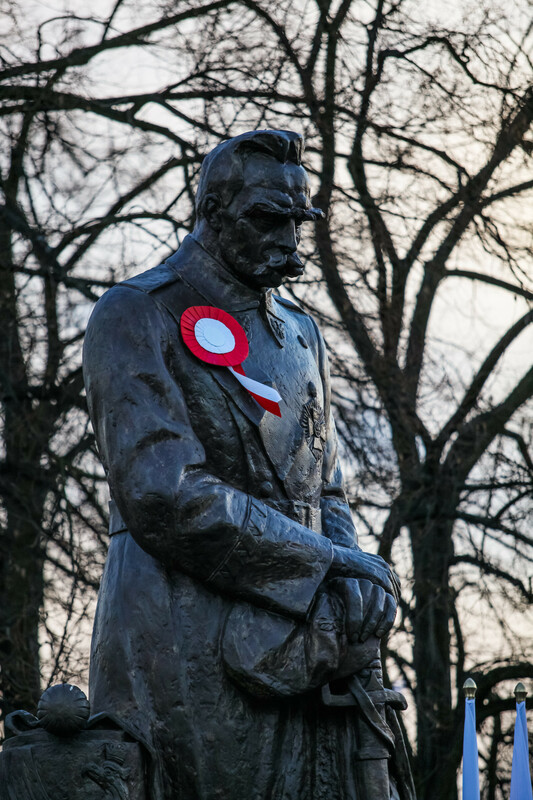 Such an ethos would remain in the Polish psyche for the duration of Poland's gradual dissection – even after regaining independence, the nurturing of resistance, both intellectual and militaristic would remain a key feature of Polish struggles for freedom well into the 20th century. Now, as history has shown, you cannot simply wipe away a collective consciousness, especially one of a kingdom which had existed for hundreds of years. What followed were inevitable wars and insurrections, all unsuccessful: The Polish-Russian War of 1792 began after attempts by the Polish Sejm (parliament) to reform their diminished state, adopting the Constitution of 3 May 1791 (the first in Europe and 2nd in the world), which was opposed by the Russian Empire and even some Polish nobility in the form of the Targowica Confederation, who wished to maintain their personal wealth and stature (gits, basically). The failed war led to the 2nd partition of Poland in 1793. Angered, the Poles began an insurrection with the Kościuszko Uprising of 1794, which ultimately failed, and resulted in the third and final partition of Poland. Ouch. 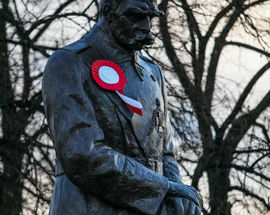 What would happen over the next 123 years, despite various forms of oppression and suppression (most notably in Russian-partitioned Poland, where a programme of 'Russification' prevented the use of the Polish language), was a formidable task, dangerous at times too, as the people of Poland passionately protected and nurtured the very concept of their cultural identity. Among themselves, within families, underground schooling, and the émigré groups, everyone learned to remain true to their national cause, and most importantly, be themselves. It was at this time the power of literature, poetry and music was employed by the likes of Fryderyk Chopin, Adam Mickiewicz and Henryk Sienkiewicz, to name a few, enthusing notions of a proud history through the power of Romanticism. 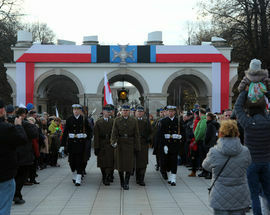 So powerful was the notion of regaining independence, each time there was opportunity, Poles joined causes en masse. 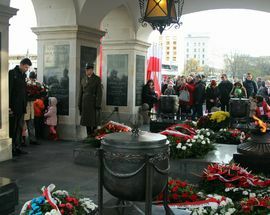 Polish history is littered with failed military ventures and insurrections during the 123-year hiatus; the most notable ventures were the inclusion of Polish legions in the Napoleonic Wars (1803-1815), the November Uprising (1830-31) and the January Uprising (1863-64), all fought against the Russian Empire. 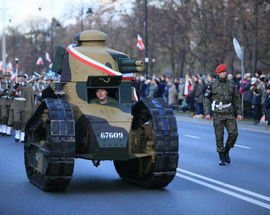 And so it was to be, Poland regained its independence, but of course, this was not the end of the struggle, for there were now numerous territorial claims to deal with. 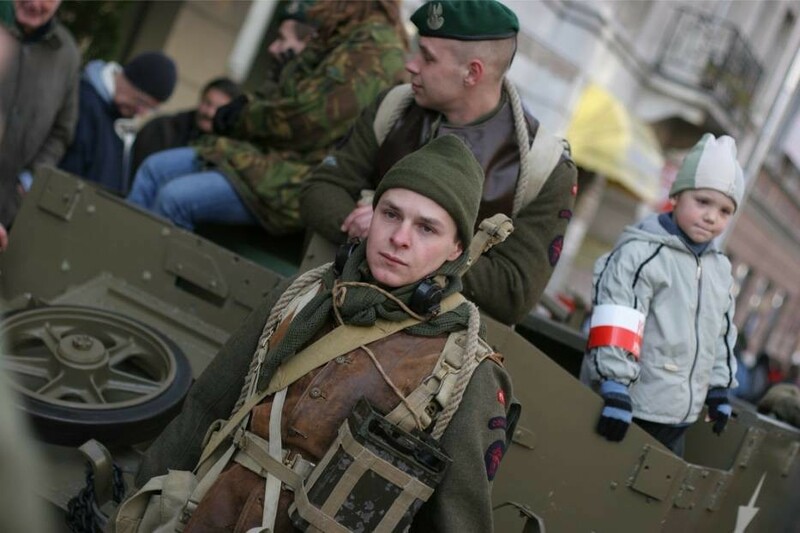 The first of these conflicts - the Polish-Ukrainian War (1918-19) - actually started on 01 November, with the recently independent Ukrainian People's Republic over territories around current day Lviv (Polish: Lwów). 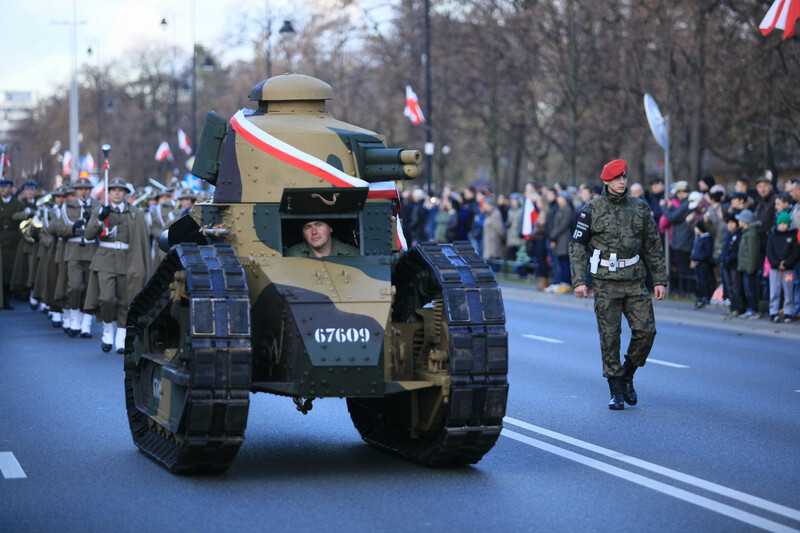 The 2nd began at the end of 1918 with the Wielkopolska Uprising to control Poznań and the surrounding area. Both were successes. 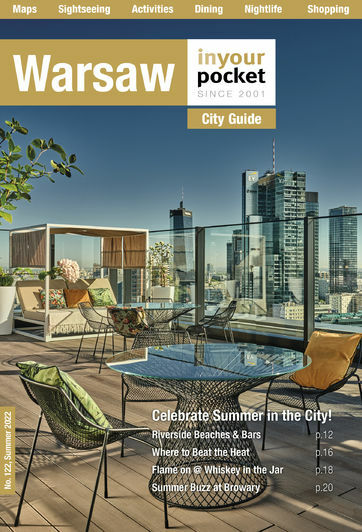 Territorial battles continued with Czechoslovakia, Lithuania, and a series of Silesian Uprisings, but Poland's very existence hung in the balance during the Russo-Polish War (1919-1920), the key point being the Battle of Warsaw (1920), also known as the 'Miracle on the Vistula' (Cud Nad Wisła) when Bolshevik Russia very nearly put an end to the reborn Polish state. Thanks in large part to a risky tactical flanking move by Józef Piłsudski and his cavalry, the invading Bolsheviks were routed and their plans to hook up with Bolsheviks in Germany failed. Where from there? Well, we did say Poland's history certainly has been bloody! 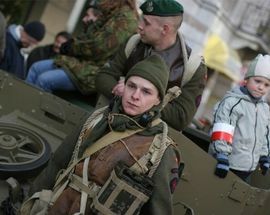 The interwar period was relatively calm, leading to a slow but steady growth, but sadly enough, National Independence Day, constituted in 1937 was only celebrated twice before World War II when Nazi Germany and the Soviet Union invaded Poland in September 1939. After the war, Poland would become a satellite state of the Soviet Union. 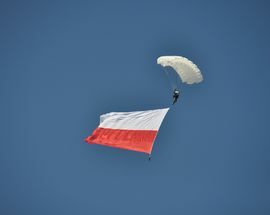 In PRL (Polish People's Republic) times, Independence Day was moved to 22 July to honour the day the PKWN Manifesto (a document that basically asserted communist authority over Poland) was issued in 1944. In 1989 after communism fell, the holiday was restored to its original date.